At the time my kids were each other’s favorite playmates and one of their favorite games was Trucktown Tornado. Trucktown was largely invented by my daughter. Many of the cars had names and personalities, they lived in a fictional place called Trucktown. During Trucktown Tornado the cars all had to drive to safe places where the kids would cover them with blankets. During Trucktown Restaurant my daughter took lunch orders, which she and my son filled with play-doh food. My son wanted to play with cars, my daughter wanted to play with my son and so she created a story around the cars. Whether its nature or nurture, most of the little girls I know prefer a narrative structure to their play. It makes sense for toy companies to market to girls by creating toys that have a narrative structure. Why then does the above picture disturb me (and judging by my Facebook feed a large portion of other people I know) so much? When I posted the picture to Facebook I mocked it, but here’s a dark truth. When I was a little girl I had Lincoln Logs. I liked to play with them. But I didn’t build houses with them, I played house with them. There were three distinct sizes of the logs perfect to create a mommy log, a daddy log and a baby log (you know the little ones for the corners). With the stacks and stacks of Legos we owned, I built nothing but houses, complete with white picket fences and flowers. Also, the Lego people got married and lived in the houses. I had a toy tool kit, you guessed it the screwdriver was the daddy (I know). I even remember anthropomorphizing my rock collection. Now, I was a special case, not allowed to have a Barbie Doll lest it give me an unrealistic body image, I was desperate. But, that’s sort of the point. Growing up in a typical 1970s second wave feminist household, before the ubiquitous pink marketing we now see, I still just wanted to play house. 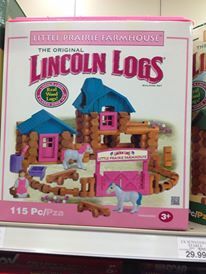 So why am I so bothered by the pink Lincoln Logs? It can’t just be that they’re tacky looking. It can’t just be that they’re unnecessary, the large majority of toys in my house are unnecessary. They just seem so regressive. Over all there’s a feeling that gender roles are becoming more, not less fluid. The girls I know flow easily between “types” being sporty and tomboyish one day and girly and dressy the next. I know young boys with hair longer than my daughter’s, and girls not with cute pixies but just short chopped hair. In preschool my son was not the only one to show up occasionally with painted nails. This idea that toys should be clearly marked with pink or blue for girl or boy just doesn’t seem to fit in with the world in which my children live. Lincoln Logs is an old fashioned company, but it does it have to be quite so old fashioned? This entry was posted in Family Life, Marketing/Social Media and tagged children, Lincoln Logs, play, toys. Bookmark the permalink.